Posted June 23, 2017 • filed under Experience. A version of this illustrated article was given by J.R. Carpenter as a Keynote Address at the New Media Writing Prize Award Event at Bournemouth University in January 2017. According to a note, I wrote in a primary school scrapbook when I was eleven years old, my favourite subjects in school were maths and science. 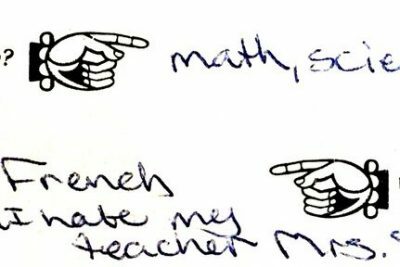 My least favourite subject was French. So naturally, the minute after finishing secondary school I moved to the French-speaking city of Montreal to study Fine Art. I graduated with a BFA in Studio Art in 1995, six months after the release of Netscape, the first public web browser. I have been using the web as a medium for experimental writing since its inception, but my digital work remains heavily inflected by the material practices of drawing, collage, crochet, and sewing. The first thing I did after art school was to apply for a visual arts thematic residency at The Banff Centre. The theme of the residency was Telling Stories: Telling Tales. I wrote a fictional artist’s statement, in which I told them I was a writer. For some reason, they believed me. During the residency, I tried to make a small book work that told a circular story, but when people got to the end they just stopped reading, because that’s how books work. Then the guy in the next studio over told me that if I rewrote the story in HTML I could link the last page to the first page and the story could go round and round. When I got back to Montreal, my artist friends informed me that web-based work was elitist, because so few people could access it, and my writer friends assured me that the internet would never catch on. Fishes and Flying Things is still online and it still works. 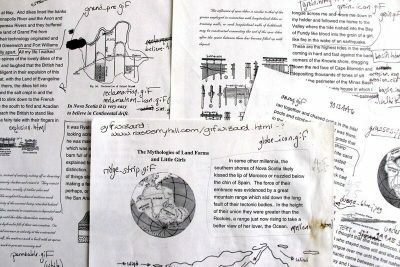 In 1994 or so I attempted to use QuarkExpress to write a non-linear, intertextual short story which incorporated diagrams and texts from old geology and civil engineering textbooks into a first-person narrative. This story appeared in print in Postscript, a journal of graduate criticism and theory published by Memorial University, Newfoundland, Canada, in Spring 1995, but I remained unsatisfied with the linear layout. In 1996 I used a fountain pen to write hypertext markup language on a print out of my own QuarkExpress layout. 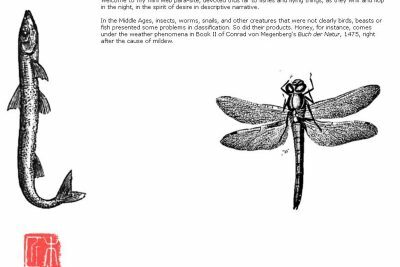 In the resulting web-based iteration of Mythologies of Landforms and Little Girls, readers can choose their own narrative path through the story. Because I went to art school, for many years I thought I was a media artist. In 2000 I was commissioned to make new web-based work called a sleep I fell for an exhibition called Engaging the Virtual at the Dalhousie Art Gallery, in Halifax, Nova Scotia. The web had only been around for five years. I was the only web artist in the show. On one page, a quadratic equation shrouds a charcoal drawing I’d made from a live model when I was in art school. 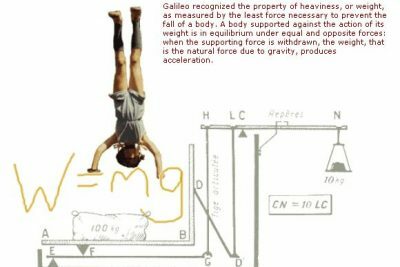 On another, a photo of me attempting a headstand back in the days when I wanted to be a math teacher teeters over a hand-drawn equation. Elsewhere in the work there appeared a short text about a woman who dreams of flying, which I supposed was a prose poem. A few years later, when I was starting to write fiction more deliberately, I made a note in my notebook to develop this text into a short story. I wrote out a plan for how to go about it. A few weeks later I saw this note, went to my computer, opened up the file, and found that I had already expanded the prose poem into a short story called Precipice, but not at all in the way that I had intended. I submitted the file as it was to the CBC Quebec Short Story Competition, which it won. Okay, fine, I thought. So maybe I am a fiction writer. I could tell a similar story for just about every one of my works. Things I think are prose poems turn into short stories. Things I think are web-based somehow become physical. My web-based work Entre Ville started off as a poem written with a pen and published in the early UK-based online journal Nth Position in 2005. The web-iteration was commissioned by Oboro, a visual and media art gallery, for the 50th anniversary of the Montreal Arts Council in 2006. It’s included in the Electronic Literature Collection Volume Two and has been widely taught in English departments in universities around the world. 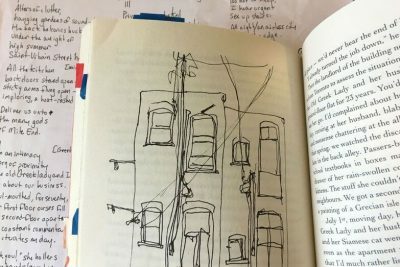 My first novel, Words the Dog Knows (2008), re-mediated images and texts from Entre Ville, and two other born digital works – How I Loved the Broken Things of Rome and in absentia. The novel sold its run and is now out of print, but the web-based works are still online. By the time my web-based work CityFish was short-listed for the New Media Writing Prize in 2012 I had been working on it for over fifteen years. It started off as a very short story told from the first-person point of view of a fish. A very early web-based iteration was presented in an exhibition in Nuremberg, Germany, in July 1998. 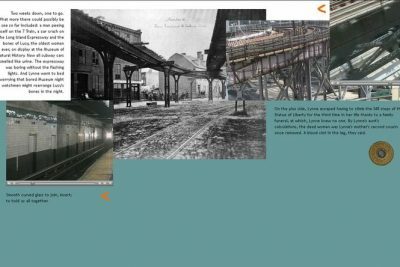 An archive of photographs, video, found images, maps, objects and quotations accrued over the years. The very short story expanded into a regular-sized short story. The point of view gradually shifted from first-person fish to third-person girl. Somewhere in the midst of this process, I started applying for funding for another web-based project called The Elevated. My first grant application wasn’t successful, but I did get into a residency at The Banff Centre, where I edited about twenty-five short videos for the project. Three years later I re-submitted my grant application. Whilst I was waiting to hear back it struck me that the CityFish story was actually the text of The Elevated project. I began work immediately and was already a third of the way through by the time the funding came through. In 2015 I won the Dot Award for a proposal to create a new web-based piece called This is A Picture of Wind. I intended for this work to respond to the storms which battered South West England in early 2014, resulting in catastrophic flooding in Somerset and the destruction of the seawall and rail line at Dawlish. Listening to the news in the months after these storms, I was struck by the paradox presented by attempts to evoke through the materiality of language a force such as the wind, which we can only see indirectly through its affect. I began to explore weather, and wind in particular, in all its written forms. My love of science resurfaced as I looked through mountains of private weather diaries held at the Met Office Library and Archive in Exeter, applied for further funding to develop the project, and worked with other writers to generate new writing on the weather. During the first week of August 2016, I had the pleasure of participating as a principal performer in the South West Poetry Tour, along with Steven Fowler, Camila Nelson, John Hall, Mattie Spence, and Anabel Banks. Each night we performed new works written in collaboration. In my collaboration with John Hall I used classical texts on weather as raw material, and in my collaboration with Anabel Banks, we worked with two texts on clouds. Anabel added one tricky constraint to our collaboration, that we write in hendecasyllabic — eleven-syllable lines. Agreeing to this would later come to haunt me. In early September 2016, I was commissioned by NEoN Digital Arts in Dundee to create a new work for their festival set to take place in November of the same year. The theme of the festival was The Spaces We’re In. The curators asked artists to respond to the physical and digital spaces we live and work in, and consider alternatives uses and futures for them, both virtually and materially. I immediately knew I wanted to talk about the environmental impact of so-called ‘cloud’ storage. I’ve thought and written a lot in the past about the complex relationship between biological, digital, and networked memory. The scale of the digital cloud is too vast to think about in terms of the body. I had to think bigger, so I turned to the clouds in the sky. The resulting work, The Gathering Cloud, builds upon Luke Howard’s classic essay On the Modifications of Clouds (1803). Howard was the first to standardise the names of clouds that we still use today. I incorporated other more recent online articles and books on media theory and climate science. Just to keep it interesting, I decided to stick with the hendecasyllabic constraint. I situated sparse hypertextual hendecasyllabic verses within surreal animated gif collages composed of images materially appropriated from publicly accessible cloud storage services. 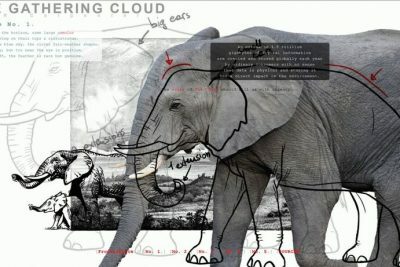 The cognitive dissonance between the cultural fantasy of cloud storage and the hard facts of its environmental impact is bridged, in part, through the constant evocation of animals: A cumulus cloud weighs one hundred elephants. A USB fish swims through a cloud of cables. Four million cute cat pics are shared each day. The Gathering Cloud, launched at a Pecha Kucha Night in Dundee, the night of the US elections. I hadn’t intended for the title to wind up sounding quite so ominous, but now more than ever we need to find ways of talking about the enormity of climate change in human terms that we can understand and act upon. 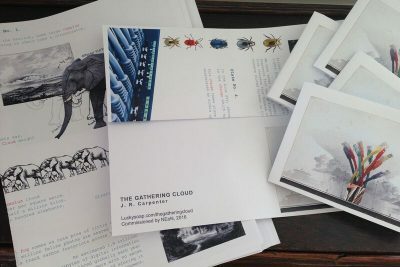 A small print iteration of The Gathering Cloud was produced at the same time as the web iteration. It continues to be shared through gift, trade, mail art, and small press economies further confusing the boundaries between physical and digital, scarcity and waste. 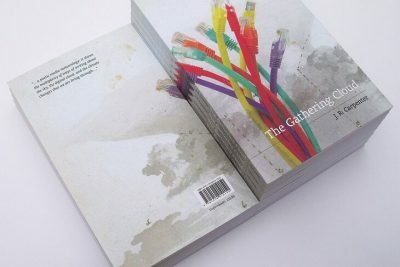 In January 2017 The Gathering Cloud won the New Media Writing Prize. In March 2017 The Gathering Cloud was an Editor’s Pick in the Saboteur Awards. In May 2017 a print-book iteration of The Gathering Cloud was published by Uniform books, with a foreword by Jussi Parikka and an afterword by Lisa Robertson. This book collates and extends the research that went into the web iteration. This research material is presented as a sequence of texts and images, acting both as a primer to the ideas behind the project and as a document of its movement between formats, from the data centre to the illuminated screen, from the live performance to the printed page. In his foreword, media theorist Jussi Parikka, author of A Geology of Media, describes the work as “a series of material transformations made visible through a media history executed as digital collage and print publication, hendecasyllabic verse, and critical essay”. Somewhere in the middle of this cloud gathering process, funding finally came through to develop the wind project I had set out to make in the first place. I am now working with IOTO: DATA to create a new commissioned web-based work called This is a picture of wind. Things rarely turn out the way I intend them to, but so far this has mostly been a good thing. J. R. Carpenter is an award-winning artist, writer, and researcher working in the intersecting fields of performance writing, digital literature, and media archaeology. More information about her work can be found on her web-site http://luckysoap.com.